Hello my friends, welcome to our kitchen! This is where the REAL magic happens. I’m talking about cookies, of course! But in all seriousness, is it not true that whenever guests come over everyone gathers in the kitchen at some point? 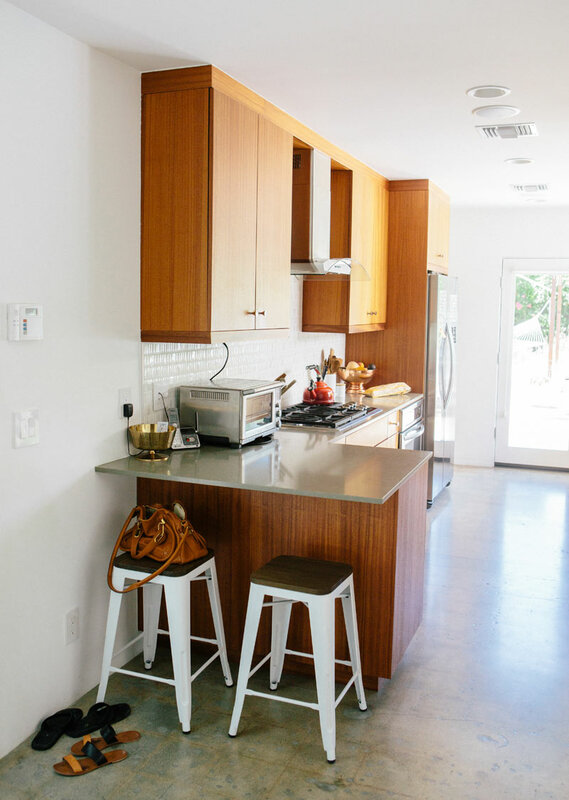 Even when it’s a galley kitchen with barely any space to socialize, it’s a hub! When we moved into the house the kitchen was white (seen above) and in all this time we hadn’t really thought to personalize it much. I guess it felt like a room of function for me. A room I loved, for sure, but didn’t know how to put my own spin on. This post was sponsored by Benjamin Moore. Thank you for supporting our incredible sponsors! At first the new paint doesn’t feel like a drastic change happened but the second last photo shows that the wood color of your kitchen cabinets comes out much nicer now and the whole kitchen is much more in harmony. Hi Kati! I agree, it doesn’t seem too dramatic but actually makes a huge difference in the feel of the room. I love it so much! this paint color is magical. i love it! 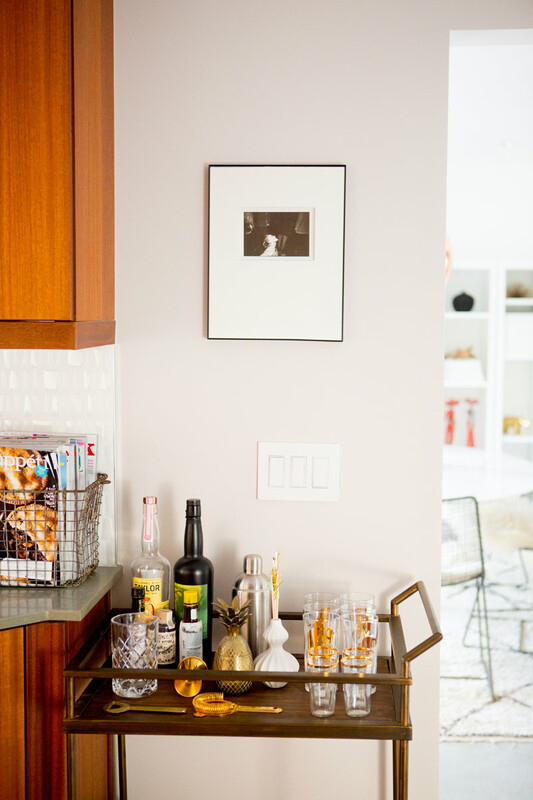 also, what is the photo above the bar cart? it looks super fun, but can’t completely make it out. The color is subtle, but it does warm up the room. Your kitchen looks great! 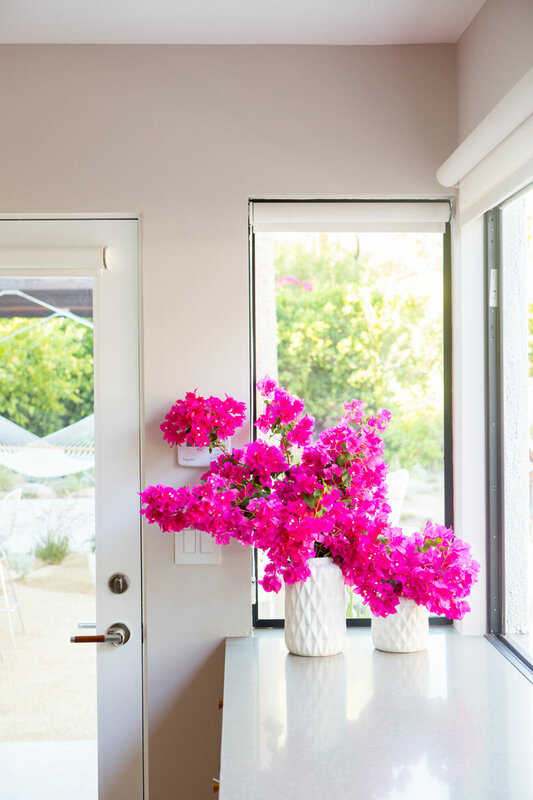 I really love the hot pink flowers you added to add a pop of color! Such a soft neutral, really works with your cabinets and floor. I might also extend the counter material down alongside the seating area where the stools are. It would look a bit more finished and modern – though it looks great now as well. 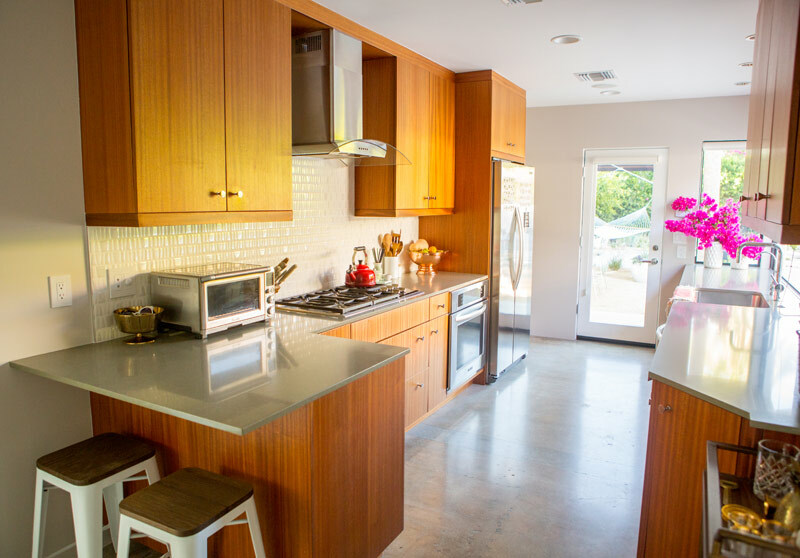 How is your kitchen floor done – is that patterned waxed concrete? I like it! It’s quite beautiful, Sarah! The entire room is just so gorgeous. I do adore your style. 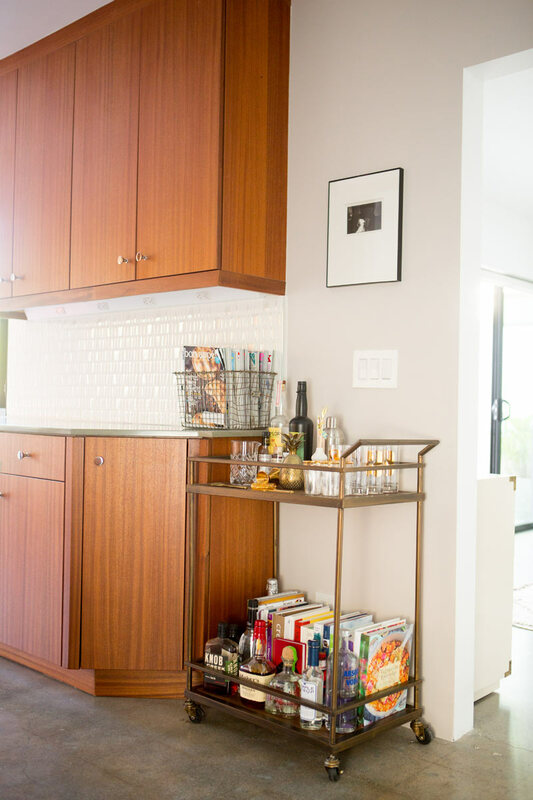 🙂 Also.. bar cart! Where did you get it? It’s exactly what I have been looking for. Stunning! I love a neutral kitchen. 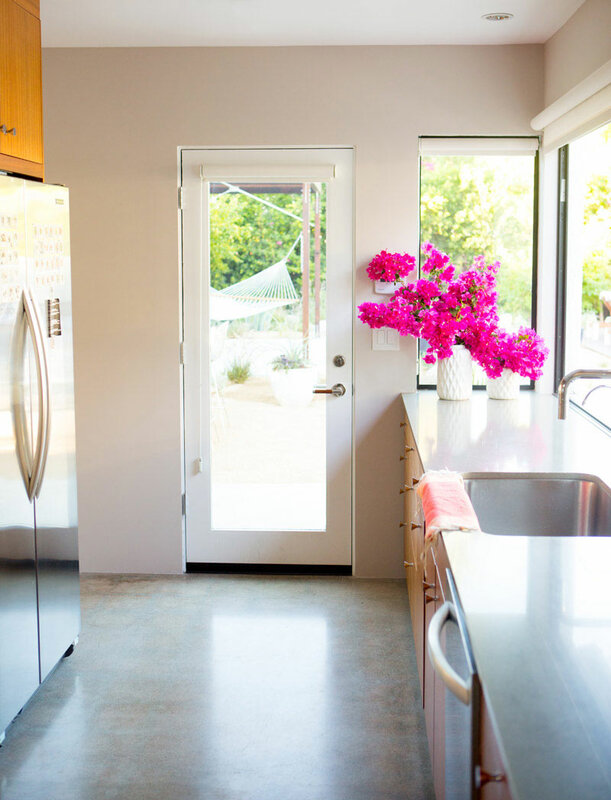 And those bougainvillaea look INSANE in your modern kitchen. 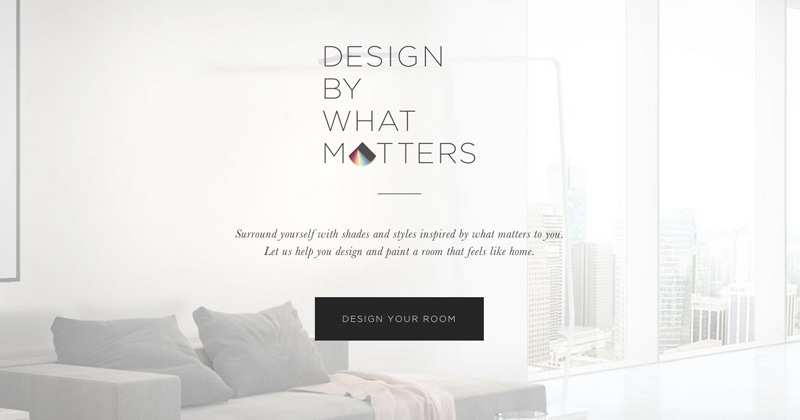 Hi Sarah, love this post, the colors …it’s all gorgeous. May I inquire as to the source of the dining room bookshelves? Hope you’re having a good day. Cheers. I adore those cabinets and the counters are lovely too! Love your home, I want to live there now!! I must ask, where is that amazing dining room table from? This is beautiful! My husband and I live in a mid century modern home with a narrow kitchen off the side of the house that’s similar to yours. Since we can’t have an open kitchen to the inside of the house, we have dreamed of having it open to the outside like yours. It gives me hope that someday our kitchen can look beautiful too. Here’s our kitchen and blog if you’re curious: http://www.jjmodern.com/?p=251 Thanks for the inspiration! Looks great! Where is the door hardware from?